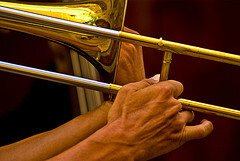 Trombone Player Wanted is a strong 6 DVD series on putting our strengths to work by Marcus Buckingham. If you would like to learn more about this series I encourage you to read the review available below. A free 18 page detailed PDF E-review of this series was on this site but it became unavailable when the site was revised. I have put the resource back on the site and apologize to anyone who had difficulty accessing the resource.